It’s like a Ranger Raptor, but better. Buyers in the U.S. have begged for a rugged Ford Ranger Raptor Stateside. Unfortunately, it looks like we likely won't get the tough truck until 2020 (if at all). But Hennessey has a remedy for the Raptor blues. The Texas shop today unveiled its outrageous-looking VelociRaptor Ranger, complete with off-road cues inspired by Raptor – and then some. 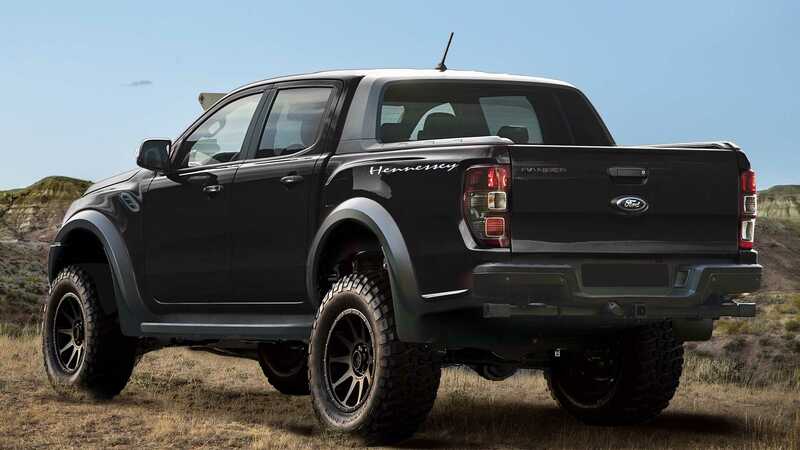 Not only is the Hennessey VelociRaptor Ranger larger (both in width and height), it's more powerful, too. Ford's turbocharged 2.3-liter engine is underhood, but Hennessey engineers boost power from just 270 horses (201 kilowatts) to a raucous 350 (260 kW), and torque from 310 pound-feet (420 Newton-meters) to 385 (521 Nm). That's way more than the 300-hp Ranger tune Hennessey touted last month. All that extra oomph comes courtesy of a new high-flow air induction system, a stainless steel catback exhaust system, and a retuned ECU. The VelociRaptor will get to 60 miles per hour (96 kilometers per hour) in 6.1 seconds. The modded Hennessey is 1.3 seconds quicker than the factory Ranger, and nearly as quick as the F-150 Raptor (5.7 seconds). With Hennessey's Stage 1 off-road suspension setup, the VelociRaptor Ranger stands four inches taller than the factory model. Combined with 17-inch HPE wheels wrapped in upgraded BF Goodrich off-road tires, the VelociRaptor Ranger is six inches taller than the stock version. Other standard goodies include a new front bumper with LED lights, while optional features include a winch upgrade and a roof-mounted LED light bar. "We are so excited to introduce our 2019 Hennessey VelociRaptor upgrades for the 2019 Ford Ranger truck," John Hennessey said in a statement. "The demand for our VelociRaptor upgrades for the Ford Raptor truck has been incredible over the past 10 years. We are thrilled to be able to offer increased power, performance – on- and off-road all packed in our exclusively branded VelociRaptor package." All that extra kit won't come cheap, though. The base Ford Ranger starts at $24,300, but Hennessey's upgrade is a whopping $64,950. That includes the cost of the donor Ranger. The company will build just 500 examples of the Hennessey VelociRaptor Ranger in 2019.